When it comes to acquiring fuller hair, everyone wants it to be natural and the core of natural is to see and feel nothing. When a client can’t see or feel anything but their own hair, they are ultimately comfortable. The art of adding additional hair which has never been achieved is the ability to add hair in a way you feel and see as if nothing is there but all your own hair. If someone has additional hair added and they feel nothing but their own hair, this becomes a vitally important detail to achieve. The need for adding additional hair for everyone is extremely emotional, so the ability to add hair which feels and appears as if nothing is there and/or feels and appears nothing has been added causes an individual to forget any hair was added at all. Achieving this is a major breakthrough benefit which has never been achieved until now. The invention of the Micro Strands has made this possible. Now, for the first time ever, individuals can add additional hair with the feeling as if there is nothing there but their own hair—a truly remarkable achievement for mankind. Stranding by InvisaBlend is and how it works and then actual real-life proof when they come into your business by letting them feel and see the Micro Strand invention. 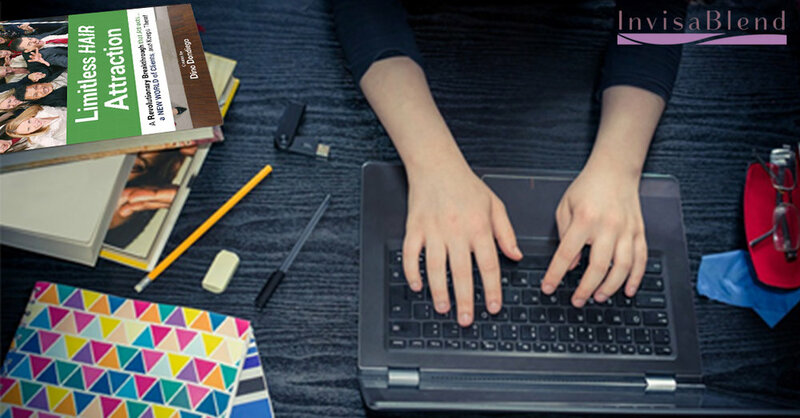 As you read on, you’ll learn about a FREE Trial you’ll offer which enables your prospective clients to experience the results of the service you will be providing. We business owners worry about that same thing with every one of our clients; we want each client to stay with us. But what if you had an exclusive product and service of which virtually guarantees your clients to STAY within your company? This revolutionary product and its unique services are tied together. You can’t do one without the other. So, your business is protected from any staff member leaving your company and offering this same product and service. Keeps more of your hairdressers, or keeps them longer. Protects your company from losing clients, or at least your best clients, which are clients in love with this revolutionary product and service along with personalized way you support these clients. Thinking logically, if your company had a revolutionary product that needed your specialty service to maintain this unique product, plus your hairdressers could only provide this specialty service within your company, would this pretty much guarantee you repeat business? Hello and Welcome to another Limitless Hair Expert video where we combined expert hair advice with self-improvement advice and my name is Dino and today's subject is “Do you think about your hair more than 10 minutes a day” I heard that phrase many many years ago and it really made an impact in me because what I found out and helping people through the years I'm a hairdresser I've been in the business of adding hair or in the field of adding hair and helping people since 1975 and what I found out is a lot of people that don't have a clear head all right I'll tell you what I mean by that in reference to their hair I found some people that they would be very upset about their hair and theirs their life through the day they're thinking about their hair or you might say they're thinking about their hair more than ten minutes a day and that sort of blocks their life it interrupts their life and that's not good if you're not happy with your hair whether it's the volume of your hair or whatever it is please do something about it research find out what to do you can always go to our website because we have a very unique revolutionary concept but do something make the move. Now also I've seen other people that had problems with their hair and they would wear hair and what I mean by wearing hair some of them had a hair extension some of them had a hair system of some sort similar and wigs but even though they had somewhat solved their hair problem which really wasn't totally true because they weren't clear-headed about it which I'm going to explain that in a minute that is they walk around still thinking about their hair every time they walk in front of a light they take a picture they're always thinking about how's my hair is my hair secure does it look good all right now whether your hair is thin and you're walking around thinking about your hair more than 10 minutes a day or a lot or whether you have hair added in some sort of way and you're still thinking about your hair you're not enjoying life properly enough. So now I'm going to give you the quote for today the quote for today compound interest is the most powerful force on the universe that's by ‘Albert Einstein’ now why would I break out that it's a financial statement because I'm going to tie something in those principles or in that quote in that quote there's two key principles principle number one is consistency and principle number one is sorry principle number two is multiplication so two principles inside that quote consistency and multiplication alright now what does that mean because I want you to think about that quote and take the meaning of that quote into a different area all right when you're consistent about anything you want to do anything you want to achieve even if you want to improve your health improve your appearance when you're consistent what happens is the consistency multiplies and elevate you higher and higher and higher conversely when you're inconsistent or consistent in the other direction you don't take care of yourself then that induces you to not take care of yourself more but when you do take care of yourself it induces you to take care of yourself more which induces you to take care of yourself more and it starts multiplying and you start elevating. So please remember that principle and I'm invite you to our next limitless hair expert video and that is the hair elevation story hope to see you soon. Hello Dino here and welcome to another Limitless Hair Expert video tutorial and my name is Dino and today's subject is “How to Increase the value of Yourself through your Hair” now value of yourself is very important. I actually got this from ‘Joel Olsteen’ I was watching one of his shows and I noticed that he talked about value and how important it is and I want to sort of tie it into your appearance - all right so how do you increase your value and number, one value comes from internally, it does not come from possessions, it does not come from your position, all right. It does not come from things you get alright, it comes first from inside you have to value yourself inside first and then you do stuff exterior. So now our quote for today is take charge of your appearance and your appearance will elevate you what does that mean when you take care of your appearance on a consistent basis what happens it consistently makes you feel better about yourself and the better you feel about yourself the more your self-esteem Rises so your appearance has a lot to do with how you feel although you should still value yourself first and then take care of your appearance okay let's not forget that so take care of your appearance and work on your appearance and it'll make you feel better and it'll boost your self-esteem as I said before all right so I invite you to the next video and that videos is called do you think about your hair more than 10 minutes a day so please I hope I can see you there thank you. 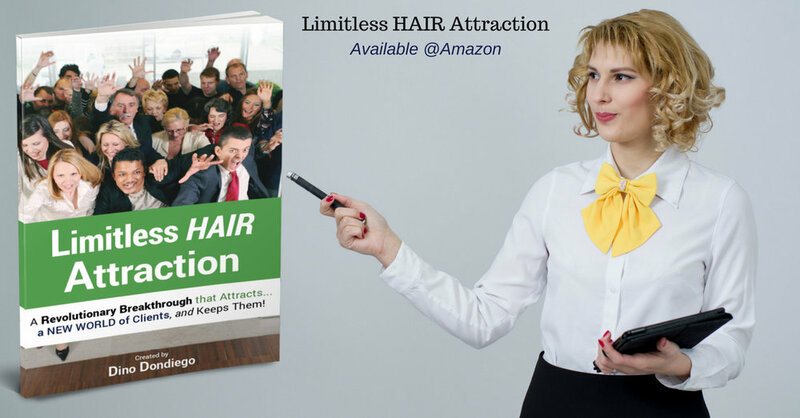 Limitless Hair Attraction - A revolutionary product and service invented by the author of this book, Dino Dondiego of which is game changer for any hair or cosmetic business. The Micro Strand Revolutionary Invention.. It all derives from the key component of Hair Stranding by InvisaBlend, called the Micro Strand. To know more about this Invention, Grab this book from our website Store. Most businesses (Salons, Hair Studios, and Medical Cosmetic Clinics) think in an ordinary way and that’s why they have ordinary business results. Many Salons, Hair Studios, and Medical Cosmetic Clinics want more business and want a very prosperous business, but conversely, they stay in their comfort zone and simultaneously expect more. When we stay too much in our comfort zone and don’t break out of our box, we technically fall back over time. Our industry is moving forward quickly just like the speed of technology, so to keep ahead, we need to offer the best, most advanced products and services. To stand out, we need to offer outstanding products and services which includes following procedures to educate the public about such unique products and services. There is now such a product and service available to qualified hair businesses. When your business is consistently growing, consistent opportunities will follow you. Hello, And welcome to another Limitless Hair Expert tutorial video. My name is Dino and today's subject is “How to get the best results out of a Hair Extensions”. Now first of all I want to explain you there are different types of hair extensions, there are hair extensions where there are little bit glue at the end of hair extensions, it’s a little bundle of hair, a little glue at the end, the most common one called Keratin hair extensions, keratin hair extensions are still done with glue. Keratin is the main protein of which your hair and your figure nails are made of it. It's a good protein, but by using glue or a bond with Keratin in it, it has no value, it’s still glue so I want you to know that first of all. Second type of hair extensions is a Bead, at the end of the little bundle of a hair there is a bead where they sub the hair through and they crush the bead onto your hair which hooks the hair to your hair. It’s a bead extension alright. And the third method of Hair extensions is a strip also called the weft they are done by tape on now a days alright, it’s a strip of hair and they put it on a strip. Now number one. Whenever you get a hair extensions the main principle you want to follow is the small the amount of hair, meaning if you do hair extensions let say bead hair extensions or bond / keratin hair extensions, the smaller the piece of hair the better it is, because the finer it is the less you can feel it. If you doing the Tape on or Strip also called the wefting, the thinner the strip is, the flatter it is, the better it is. And if you doing some other kind of clip on that’s a little bit of hair piece, the smaller it is, the better it is. Because when it’s smaller or flatter it little more difficult to see or feel or see it’s fined, alright. Secondly, And to get the best results out of hair extensions is if you ever get an hair extensions do a small amount of hair, meaning if somebody gone a do a color on hair extensions, don’t get a bunch of load over your head. You better of getting a smallest amount possible and make sure you a smaller amount because technically you should be able to get two pieces if you had to, ok. Tested and a get couple of hair first, spend a low amount of money and see how it works, See how you like it alright and see if it’s safe for your hair alright. So those are the two things, you want to add hair in smaller pieces or thinner strips and also when you add hair for hair extensions you want to add a smaller amount of hair, so you can sort of test the waters alright. So please think that through and please follow that, because it really good advice, its help the lot of people. Now our quote for today is “Your mind is like a garden, where weeds grow automatically, unless you nurture the garden with good stuff.” What does that mean, first of all that quote came out from somebody else that I don’t remember his name and what I did his I shortened the quote and power phrase it and what it basically means is Your mind is really like a garden, what happens automatically it lot of negative stuff comes. You might say your mind stinking thinking, alright. So think about that, what normally happens what all around us a negative thought, you are watching news a negative one, all negative stuffs somewhere like a garden this don’t have to weed it, they grow automatically, make it a stuff your mind comes automatically, unless you un-purpose feed your mind with good stuff. That what thee quote means weed about good stuff, read about look at stuffs that commonly alright, give your mind a good stuff and before you know that will takeover, alright. So I would you to come to our next video, the next video is “How to increase the value of Yourself through our hair” please be available to be there and I will see you soon. Tagged: Hair Extensions, Hair extention, Invisible Hair Extensions, Hair Stranding, invisablend, what is hair extension, get best hair extension, better than wigs, best hair extension, hair extension in newyork, hair extension in new jersey, hair extension usa, hair extension what? How does this revolutionary method/category of adding hair work? Why is it so different? How could this be so extremely beneficial that it will cause all other options to become obsolete? It all derives from the key component of Hair Stranding by InvisaBlend, called the Micro Strand. The Micro Strand invention before human hair is added. Finished Micro Strand after hair has been added. Know The Importance Of Elasticity in Hair and how anyone can easily test the elasticity of Hair. Hair Expert Dino has explained the significance of Hair Elasticity and Best Tips and Advice to Regain Lost Elasticity. Subscribe Now !!!!! Hello, Dino here again. And welcome again to another series of the Limitless Hair Expert. Important? Now. The elasticity of your hair is important because it gives its strength, your hair on your head stretches like a fresh elastic band, it stretches and reverts back and if you want to test the health of your hair. The best way to test the elasticity is when the hair is wet. You can test it when it’s dry but when it’s dry it has less elasticity when it’s wet it has more elasticity or more stretch ability, alright. So when your hair is wet if you pull your hair a little bit and let it go it should spring back quick. The more you can pull it and let go the faster it springs back the more healthy your hair is, the slower it springs back the less healthy your hair, okay. So think of a fresh elastic band, you stretch it, boy, it goes right back, okay. So that’s the elasticity of your hair and it very, very important, when the elasticity is strong it could take more pressure, it could take more bushing, it could take more handling, conversely when the elasticity is weak or not so good, it breaks easier, you have to be more delicate with the hair, you have to be more careful with the hair. So what I want you to do next when your hair is wet or wet your hair, I want you to test the elasticity of your hair maybe in spot, maybe in several spots and see how the elasticity is. The weaker the elasticity the more I want you to be careful with your hair, the way you brush it, the way you comb through it, the way you handle it, be a little bit more careful, in general you should be careful and you should brush your comb with the wide toothbrush or comb as I stated in another videos. But test your elasticity and then direct yourself to be a little bit more careful when your elasticity is less. Now if your elasticity is weak then what you want to do is try to find a protein shampoo, a protein conditioners, protein strengthens, alright. Protein strengthens your muscles, protein strengthens your hair, so the more you can put a protein conditioner, a protein treatment on the hair you can improve the elasticity of your hair, alright. So if your elasticity is weak try to put some sort of protein conditioner or better yet protein treatment in your hair, okay. So our quote for today is, when the big things come first, you know what you’re doing. So that’s a quote by myself, but I want to example what that means with a little bit of a metaphor, alright or story. And that is, there is the story of this professor that had this students and that we’re talking time management and how to get important things done. And what the professor did he pull out this large ways and he in gently pour this big boulders into the ways without breaking the ways. Money fill the ways with the big rocks he said to the student is the ways filled, student yield that and says yes, he didn’t say anything, he took another bucket that had smaller rocks, pour them in gently the smaller rock trigger through the big rocks and filled the ways again, he said to the student is that ways filled, is the ways filled, they said no. Now they quote on, so then he then took another and he pour another bucket that is and now we poured sand, the sand trigger through the big rocks and the little rocks fill up the ways he said to the student, is the ways filled, they said no then took water pour the water, the water trigger through the sand, through the little rocks, the big rocks and filled up the ways. Then he said what does this mean to the student and the student says do the small things in life and he said no. If I did this in reverse I will never get the big rocks in and what the means is do the important things the big things in life first because if you put off the big things in life the little things will caught up all your time and you’ll never get the big things done. So please remember that, it’s very, very important. And stay tune for our next video which is how do you know, how often to shampoo your hair. And I’ll see you soon. Thank you.